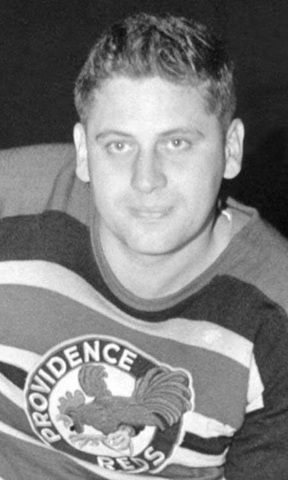 A “Class of 1972” charter inductee, “Moe” Morris skated in five campaigns with Providence from 1948 to 1953, collecting 89 points over 290 games with 16 goals, 73 assists and 76 PIM. After a brief stint with the Toronto Navy, this staunch defenseman got the call from the NHL’s Maple Leafs, dressing for 50 games, surprising both himself and the Leaf’s organization with his high offensive output. Moe went on the spend four seasons in the NHL between 1943 and 1949, scoring 13 goals and 29 assists in 135 games. Morris played on the Toronto Maple Leafs’ Stanley Cup winning team in 1944 and later won the Calder Cup with Providence in 1948.